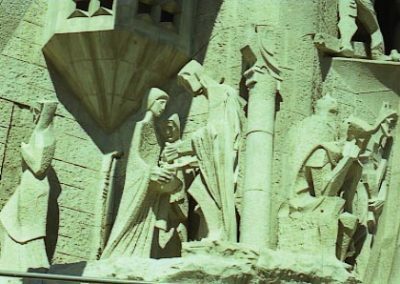 The Passion façade is recently built. 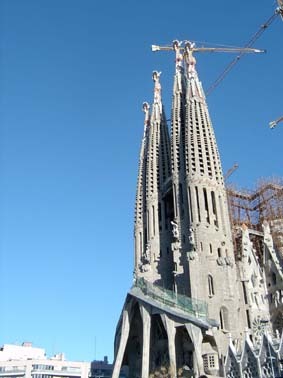 Located in the street Sardenya and oriented to west. 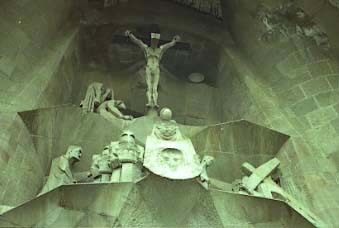 This façade represents the passion and the death of Jesus. 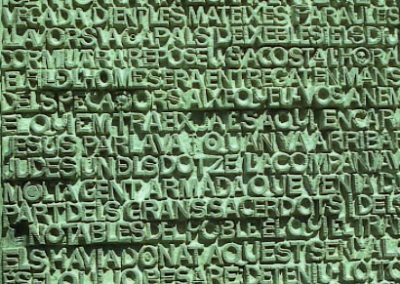 According with this function, it has an austere and extraordinarily naked appearance, with geometric edged forms. 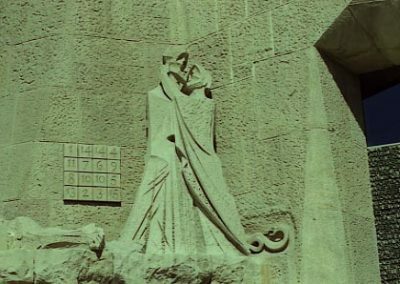 It is composed by a six columns portico, with three doors, of which the central one is divided into two by a mullion with the Alpha and Omega signs among the four bell towers. 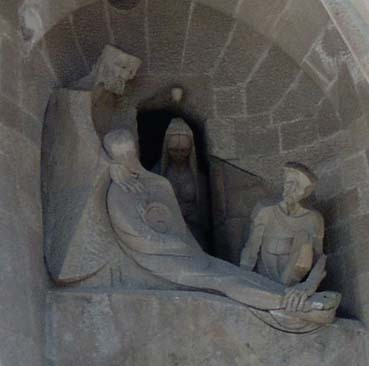 As the Nativity and Glory façade, the three entries of the Passion one are dedicated to the three Christian virtues. 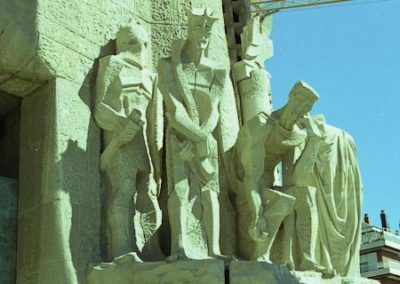 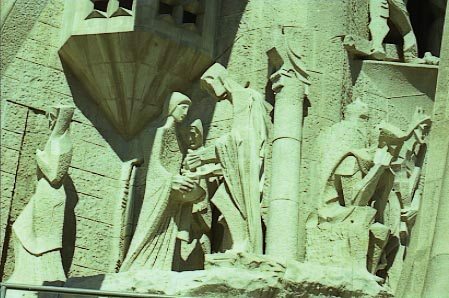 The sobriety of the façade is visible also by the presence of bone shaped columns and the sober sculptures carried out by Josep Maria Subirachs adding drama to the already deliberately sad Gaudí design. 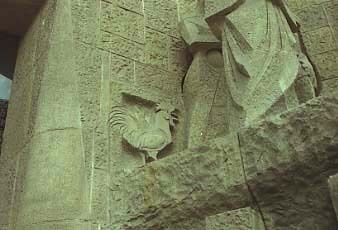 The whole respects the initial project of Gaudí with regard to its general characteristics, but the details are obviously adapted to the modern aesthetics. 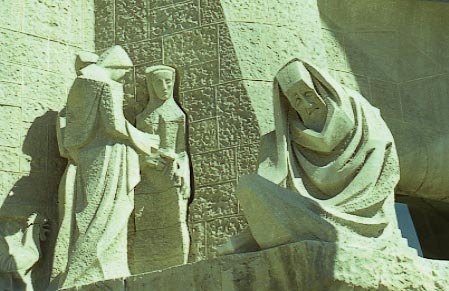 In this sense, the very symbolic iconography of Subirachs represents a total break with the figurative concept of the opposed façade (Nativity). 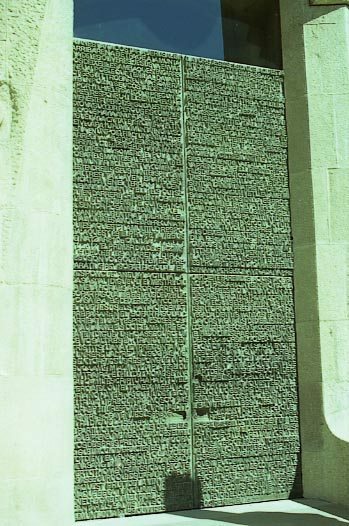 The two central ones have a height of 112 meters and of 107 meters the outsides. 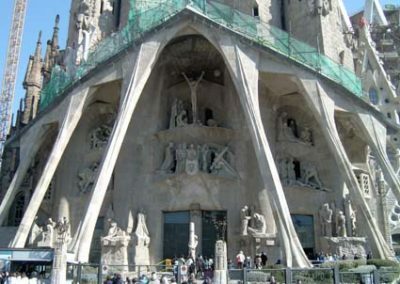 They are, as in the Nativity side, the most characteristic and main façade elements. 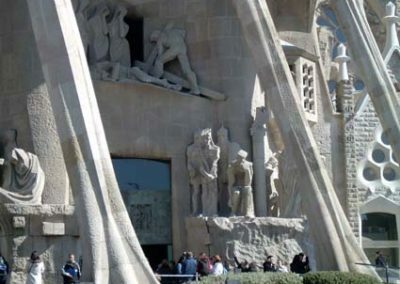 They are totally accessible through spiral stairs leaving an important central empty space. 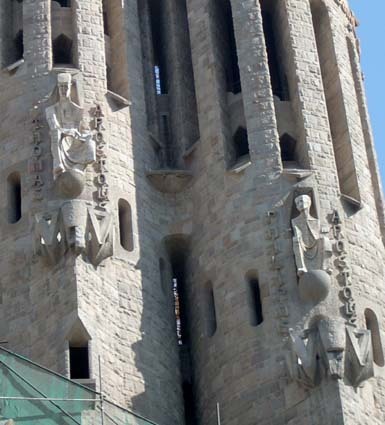 All the length of the bell towers is opened through a sort of stone blinds allowing the tubular bells sound diffusion planed by Gaudí. 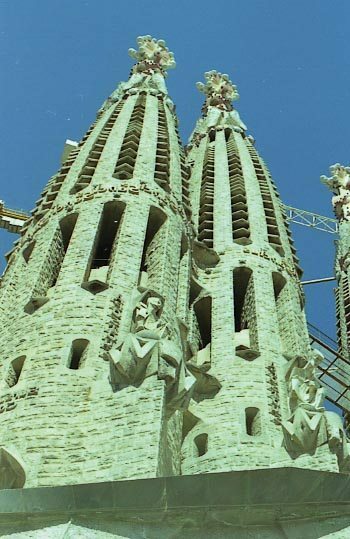 The towers are of rhomboid section, but to a certain height they come to be elliptic. Each one of the towers of this and of the other two façades, on the whole twelve, four for each one, is devoted to an apostle. 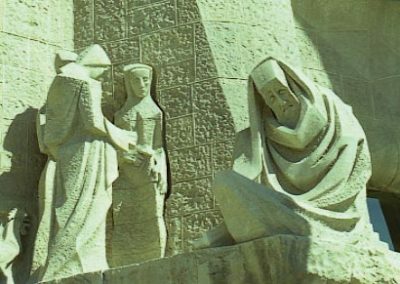 Those of the Passion façade are dedicated to Saint James, Saint Bartholomew, Saint Thomas and Saint Philip. 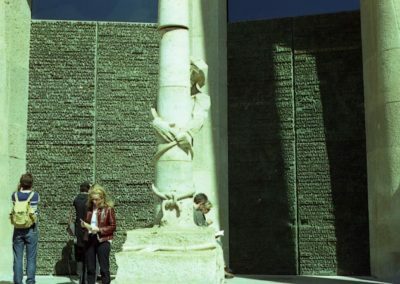 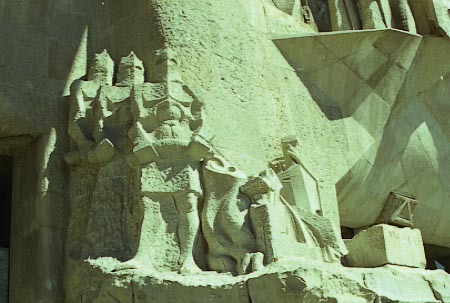 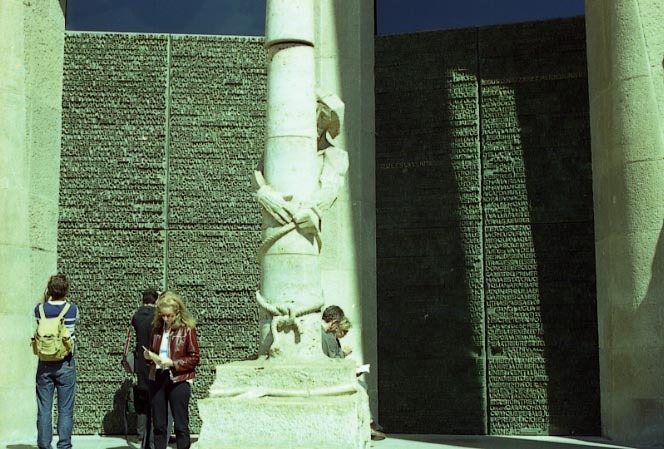 Each one of them is represented in a big statue, placed to a height of a third of the total length of the towers with his names in relief to both sides. 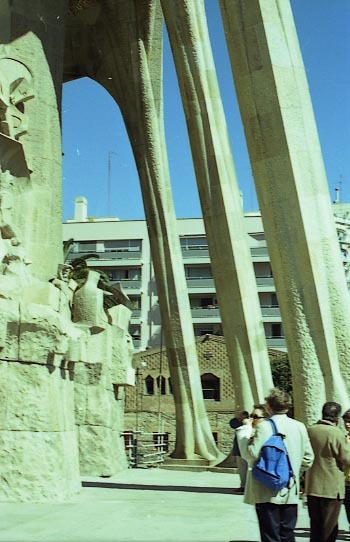 Between the two central towers and to a height of 60 meters, there is a bridge. 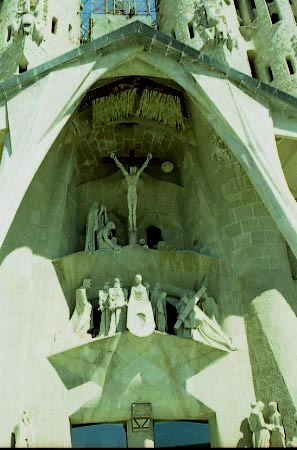 Gaudí had the idea to put an image of Jesus getting up triumphant to the sky, in contrast with the drama of the whole Passion façade. 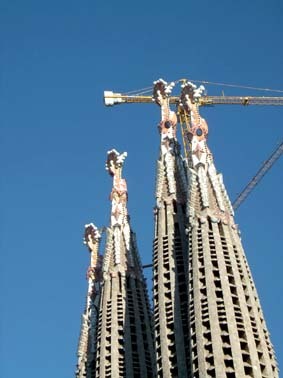 This image will be very quick installed. 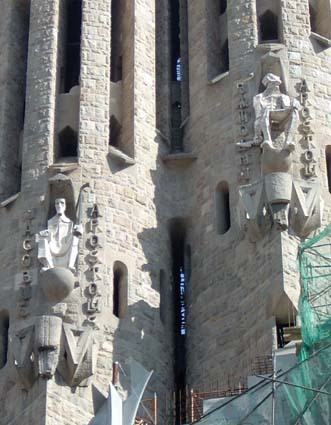 The pinnacles on the top of the towers have the same signs they have on the Nativity façade. 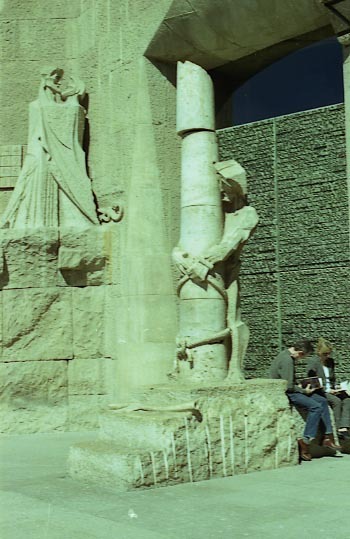 It has six outside columns inclined to inside supporting a cornice flying over it in form of a covered gallery (now under construction). 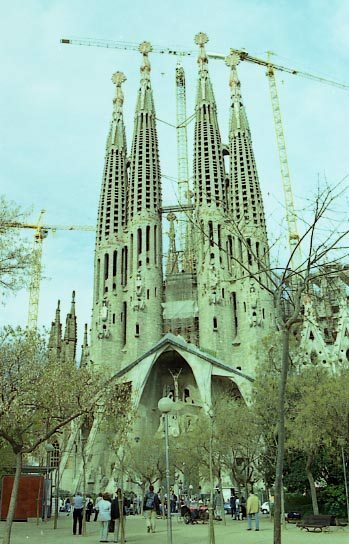 The roof of that gallery is more inclined that its base is and will be supported (when finished) by a total of eighteen small columns. 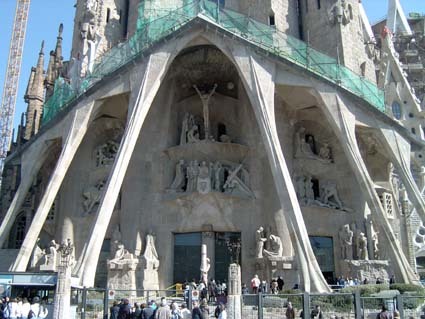 The portico will have access to the temple interior through three doors opened into the transept as three hallways devoted, as it is in the other façades, to the three Christian virtues. 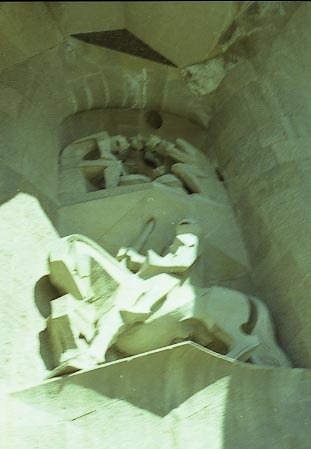 The central door is divided into two by a central mullion in which the sculptor Subirachs has carved a united Alpha and Omega. All the portico whole is a spectacular sculptural re-enactment of the Passion and death of Jesus. Here, the Gaudí project was not followed, because it had not the needed detail and another different approach was adopted, more adapted to the new times. 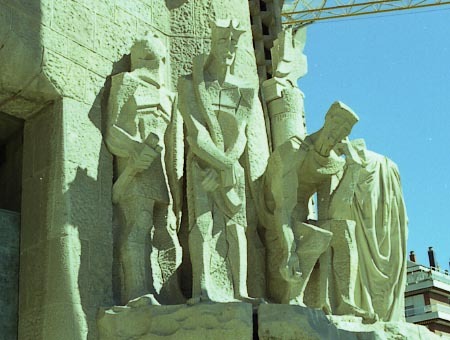 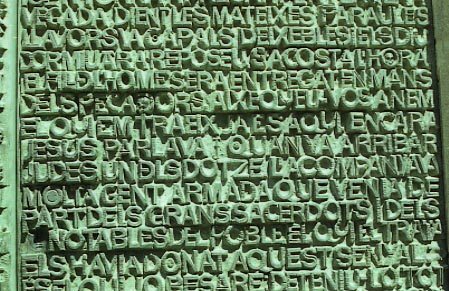 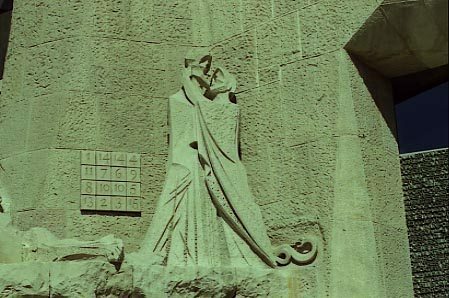 The representations outlined by Gaudí were disposed in horizontal manner, in another way Subirachs has developed a new idea in which the carved story of the Passion follow an S form. 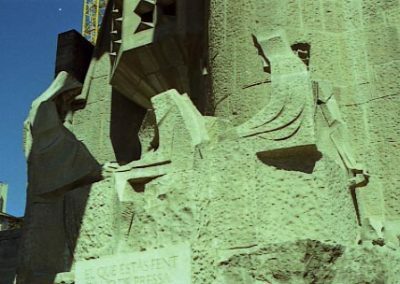 We thank our supporters below for supporting the GaudiAllGaudi.com website!